Summer jewelry essentials are a little bit different for everybody. My Mother considers long station necklaces the foundation of everything. I prefer long pendants. My friend, Miss M, wears stacks and stacks of bangles. But whatever your preferences, let’s talk about starting points. When I’m on the hunt for a new long necklace, I start at LOFT. They always have a great selection of colors, textures, and styles. This layered disc pendant is a simple basic you can wear with almost anything. I also like their mixed stone cluster necklace and this multi-strand beaded chain necklace. My second choice retailer? Chico’s. If you want color and verve in your jewelry box, shop where your high school art teacher shopped. This reversible bib necklace in faux-lapis and this mixed-metal coin necklace are the kind of pieces that add real life to a simple sheath dress. Kyle and I have been together for almost three years, so date night is usually a casual affair. When I want to jazz up that eyelet dress he’s seen 20x or the off-the-shoulder striped top from last summer, I reach for a pair of big colorful earrings. Baublebar has the best selection. I like the beaded Henna drops above and these Corsica tassel earrings for a bit of color. If you’d prefer something more neutral, these Julia resin-linked hoops mix black and white into a truly striking earring. Can’t keep heavy earrings in place, without stretching your lobes? Try these clover-back stabilizing earring lifts to give you some more oomph. Looking for statement earrings at a whisper price? H&M. I love the look of these powder pink cluster earrings and these emerald-green tassels. I love a cuff bracelet. They have great impact, but don’t jingle around like a lot of bracelets do. I once wore a stack of gold bangles into a meeting and it sounded like Carmen playing the castanets. Not great. But a cuff gives you all the style without the sound. This Maze Cut Cuff is a nice option; the lattice work keeps it light. This Nadri pave criss-cross cuff also has a similar feel in a shorter height. Or go big with this Baublebar Natania cuff. Prefer silver? This Gorjana Sia cuff has a geometric look to it. One of my favorite summer options is a wood or tortoise bracelet. It adds a natural element to casual dresses. These wooden Kenneth Jay Lane stacked bangles caught my eye; I like the cool shapes. I also like this Natori Acacia wood cuff. Also, this Jaya tortoise cuff from Stella & Dot is everything I want in a summer bracelet. So what are your summer jewelry essentials? These are the pieces you reach for over and over again. the baubles that complete even the simplest outfit. I wear a copper bracelet on my left wrist to help with arthritis in two of my fingers. (good grief, I’m only 36!) I get a ton of compliments all the time on it. It’s a link bracelet rather than just solid copper. How do you wear your hair when you wear statement earrings? Wearing it up seems too Carmen Miranda, but if it’s down I feel like the earrings get hidden or lost. I sometimes wear it half up, or I’ll tuck behind my wears and tease the crown a bit. Where is that star ring from the headline image?!? It’s probably way out of my price range, but it’s so fun and I want it! I Reverse image searched it, nothing. 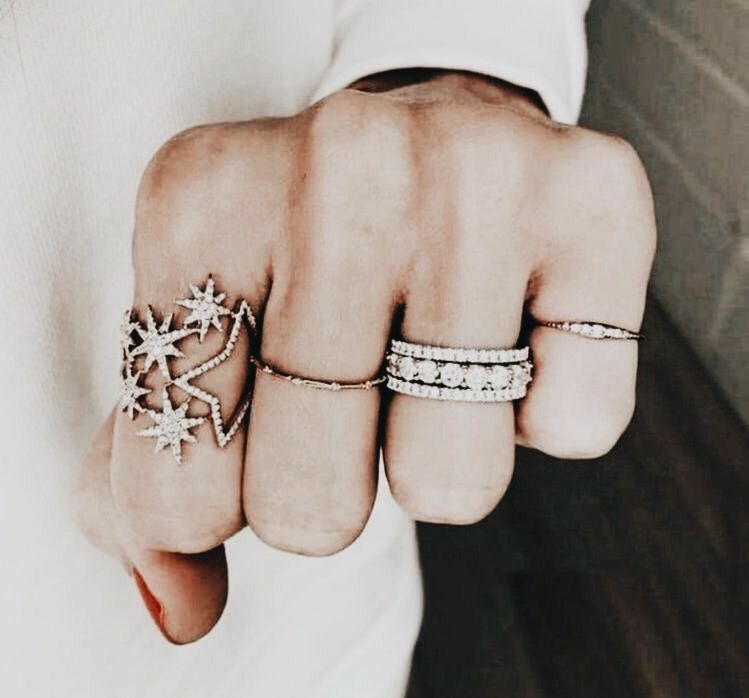 I want, no, need, the star ring in the bottom right photo. Any idea where it’s from? The link just takes me to a larger image of the original. Thanks! Local Eclectic has a lot of celestial themed jewelry that are super pretty and affordable. Was curious also about the ring – it’s a one of a kind from a line called Luna Skye – by Samantha Conn.